And now once more we have to beg the reader not to lend an ear to the charge – against Theosophy in general and the writer in particular – of disrespect toward one of the greatest and noblest characters in the History of Adeptship – Jesus of Nazareth – nor even of hatred to the Church. The expression of truth and fact can hardly be regarded, with any approximation to justice, as blasphemy or hatred. The whole question hangs upon the solution of that one point: Was Jesus as “Son of God” and “Saviour” of Mankind, unique in the World’s annals? 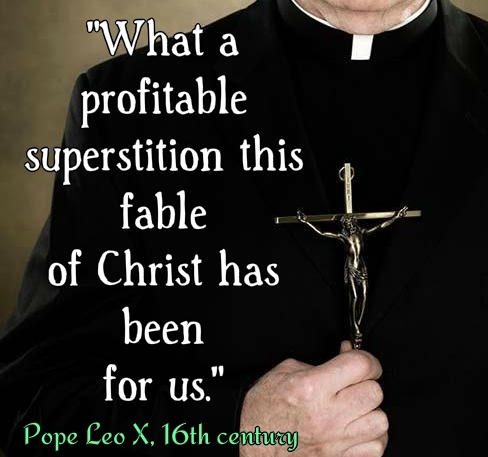 Was His case – among so many similar claims – the only exceptional and unprecedented one; His birth the sole supernaturally immaculate; and were all others, as maintained by the Church, but blasphemous Satanic copies and plagiarisms by anticipation? Or was He only the “son of his deeds,” a pre-eminently holy man, and a reformer, one of the many, who paid with His life for the presumption of endeavouring, in the face of ignorance and despotic power, to enlighten mankind and make its burden lighter by His Ethics and Philosophy? The first necessitates a blind, all-resisting faith; the latter is suggested to every one by reason and logic. Moreover, has the Church always believed as she does now – or rather, as she pretends she does, in order to be thus justified in directing her anathema against those who disagree with her – or has she passed through the same throes of doubt, nay, of secret denial and unbelief, suppressed only by the force of ambition and love of power? Where is that God or Hero whose origin, biography, and genealogy were more hazy, or more difficult to define and finally agree upon than those of Jesus? How was the now irrevocable dogma with regard to His true nature settled at last? By His mother, according to the Evangelists, He was a man – a simple mortal man; by His Father He is God! But how? Is He then man or God, or is He both at the same time? asks the perplexed writer. Truly the propositions offered on this point of the doctrine have caused floods of ink and blood to be shed, in turn, on poor Humanity, and still the doubts are not at rest. In this, as in everything else, the wise Church Councils have contradicted themselves and changed their minds a number of times. Let us recapitulate and throw a glance at the texts offered for our inspection. This is History. The Bishop Paul of Samosata denied the divinity of Christ at the first Council of Antioch; at the very origin and birth of theological Christianity, He was called “Son of God” merely on account of His holiness and good deeds. His blood was corruptible in the Sacrament of the Eucharist. At the Council of Nicaea, held A.D. 325, Arius came out with his premisses, which nearly broke asunder the Catholic Union. Seventeen bishops defended the doctrines of Arius, who was exiled for them. Nevertheless, thirty years after, A.D. 355, at the Council of Milan, three hundred bishops signed a letter of adherence to the Arian views, notwithstanding that ten years earlier, A.D. 345, at a new Council of Antioch, the Eusebians had proclaimed that Jesus Christ was the Son of God and One with His Father. At the Council of Sirmium, A.D. 357, the “Son” had become no longer consubstantial. The Anomaeans, who denied that consubstantiality, and the Arians were triumphant. A year later, at the second council of Ancyra, it was decreed that the “Son was not consubstantial but only similar to the Father in his substance.” Pope Liberius ratified the decision. During several centuries the Council fought and quarrelled, supporting the most contradictory and opposite views, the fruit of their laborious travail being the Holy Trinity, which, Minerva-like, issued forth from the theological brain, armed with all the thunders of the Church. The new mystery was ushered into the world amid some terrible strifes, in which murder and other crimes had a high hand. At the Council of Saragossa, A.D. 380, it was proclaimed that the Father, Son and Holy Spirit are one and the same Person, Christ’s human nature being merely an “illusion” – an echo of the Avataric Hindu doctrine. “Once upon this slippery path the Fathers had to slide down ad absurdum – which they did not fail of doing.” How deny human nature in him who was born of a woman? The only wise remark made during one of the Councils of Constantinople came from Eutyches, who was bold enough to say: “May God preserve me from reasoning on the nature of my God” – for which he was excommunicated by Pope Flavius. At the Council of Ephesus, A.D. 449, Eutyches had his revenge. As Eusebius, the veracious Bishop of Caesarea, was forcing him into the admission of two distinct natures in Jesus Christ, the Council rebelled against him and it was proposed that Eusebius should be burned alive. The bishops arose like one man, and with fists clenched, foaming with rage, demanded that Eusebius should be torn into halves, and be dealt by as he would deal with Jesus, whose nature he divided. Eutyches was re-established in his power and office, Eusebius and Flavius deposed. Then the two parties attacked each other most violently and fought. St. Flavius was so ill-treated by Bishop Diodorus, who assaulted and kicked him, that he died a few days later from the injuries inflicted. Every incongruity was courted in these Councils, and the result is the present living paradoxes called Church dogmas. For instance, at the first Council of Ancyra, A.D. 314, it was asked, “In baptising a woman with child, is the unborn baby also baptised by the fact?” The Council answered in the negative; because, as was alleged, “the person thus receiving baptism must be a consenting party, which is impossible to the child in its mother’s womb.” Thus then unconsciousness is a canonical obstacle to baptism, and thus no child baptised nowadays is baptised at all in fact. And then what becomes of the tens of thousands of starving heathen babies baptised by the missionaries during famines, and otherwise surreptitiously “saved” by the too zealous Padres? Follow one after another the debates and decisions of the numberless Councils, and behold on what a jumble of contradictions the present infallible and Apostolic Church is built! And now we can see how greatly paradoxical, when taken literally, is the assertion in Genesis: “God created man in his own image.” Besides the glaring fact that it is not the Adam of dust (of Chapter ii. ), who is thus made in the divine image, but the Divine Androgyne (of Chapter i. ), or Adam Kadmon, one can see for oneself that God – the God of the Christians at any rate – was created by man in his own image, amid the kicks, blows and murders of the early Councils. This kabalistical reading of the Gospel narratives – hitherto supposed to record the most important, the most mystically awful, yet most real events of the life of Jesus – must fall with terrible weight upon some Christians. Every honest trusting believer who has shed tears of reverential emotion over the events of the short period of the public life of Jesus of Nazareth, has to choose one of the two ways opening before him after reading the aforesaid: either his faith has to render him quite impervious to any light coming from human reasoning and evident fact; or he must confess that he has lost his Saviour. Which then of the two – the clergy, or the Occultists and Theosophists – are the more blasphemous and dangerous? Is it those who would impose upon the world’s acceptance a Saviour of their own fashioning, a God with human shortcomings, and who therefore is certainly not a perfect divine Being; or those others who say: Jesus of Nazareth was an Initiate, a holy, grand and noble character, but withal human, though truly “a Son of God”? SOME RELATED ARTICLES: Dismantling the Christian Edifice, Reincarnation and Christianity, The True Nature of Jehovah, Blavatsky on Vicarious Atonement, Blavatsky on Hell and Christianity, Salvation from Christianity, Theosophy: The Ancient Wisdom, 12 Things Theosophy Teaches, Unity of the World’s Religions, The Masters and Madame Blavatsky, Responding to Lies about H.P. Blavatsky, Praise for H.P. Blavatsky and Theosophy, A Film about H.P. Blavatsky, Blavatsky defeats an Atheist, and Greetings from “Lucifer” to the Archbishop of Canterbury!